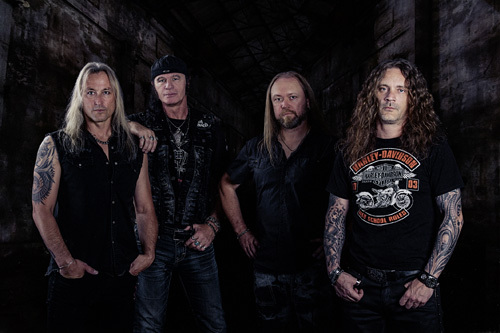 Guitarist Herman Frank is practically a legend in the German heavy metal underground, if not the larger European community. You know his work with Accept, Panzer, and Victory. His solo work has not gone unnoticed either. The guitar wizard offers his third long-player with The Devil Rides Out. Now, there's little to explain about another Herman Frank album. You pretty much know what you're going to get, so no worries about expectations getting crushed. This is straight up, extremely guitar-forward, heavy power metal. It's all about the riffs and the leads, and then it's even more about the riffs and leads. The album starts with a rush from gates and never pauses. Every song blisters with groove and speed, with Frank's guitar lines swift, slick, and soaring. Being a "keep it true" kind of guy, all the songs are wrapped in melody, harmony, and groove. It's largely repetitious, but at least Frank's consistent. So there you have it, in a nutshell. If you like anything I just wrote or you're simply a Herman Frank fan, you should get this album. But you ask, scratching your head, "Dude, you're never this brief. There's something you're not telling me. Something bugging you." Yup. You're right. And it's a point that makes me somewhat ambivalent to this album. I did not know this, but since 2011 and the Right In The Guts album, Herman Frank's go to vocalist has been Rick Altzi. You know him from At Vance, Masterplan, Sandalinas, among others. I know him as one of my least favorite metal singers. His voice is simply too raw, rough, too caustic for me and, after listening to a few songs, he does this with little variation. Yet, to be honest, his voice fits the Herman Frank heavy metal sound and, if you're patient, the music and vocals weave together in a symbiotic relationship. Essentially, for me at least, he's an acquired taste. So now you have my bottom. Bottom line? As I said earlier, if you dig Herman Frank or very guitar-centered heavy metal, Herman Frank's The Devil Rides Out is the the real deal: pure, unadulterated, keep it true, heavy power metal. 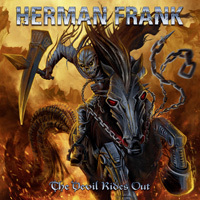 If you dig Herman Frank or very guitar-centered heavy metal, Herman Frank's The Devil Rides Out is the the real deal: pure, unadulterated, keep it true, heavy power metal.